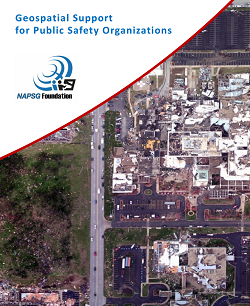 About this Effort – In developing these position qualification sheets NAPSG reviewed and assessed a large-body of existing work, including but not limited to the following: Homeland Security Geospatial Concept of Operations, URISA’s GIS Professional certification requirements, FEMA’s Qualifications System, NIMS Resource Typing structure, US Department of Labor’s competency model, and others. The position qualification sheets and resource types/packages are living documents that NAPSG will update on a 6-month or 12-month basis as updates are identified by the community. This toolbox is designed to raise awareness and support preparedness efforts. Utilized in combination with free resources for the community such as Education & Virtual Training, Organization Standard Operating Guidelines, and National Guidance Documents, you can build your GIS capacity and resilience. Our expertise is in public safety GIS, and as a non-profit we are dedicated solely to your success. Download the brochure below for more information. This is an interactive gallery that allows GIS Staff to quickly search NAPSG Foundation resources hosted in ArcGIS Online.